"When I retook Level 1 (just now after 6 years) I really wasn't in the mood for healing work. To my surprise a volcano of emotions surfaced to be transmuted. I reached burnout with all of my commitments. It all came up in class. The mandala work did its magic despite how disconnected I thought I was...It is crazy to me how this world of mandalas that was introduced to me (by you) created so much healing, magic, fun, and opportunity...and that was just Level 1! Hello?! I'm looking forward to how this work will continue to evolve and move through me into the world. Thank you Lily for your work and vision." "That weekend (retreat) in New Mexico was such a life changer for me -- I will always know it wasn't just an accident that I was there that weekend!" 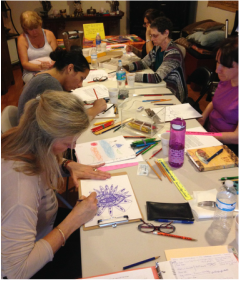 "I enjoyed the mandala workshop! The safe atmosphere, your vast knowledge, and calm pace you used, allowed me to connect and explore my inner voice and share it with the wonderful people in the room. ​Looking forward to Level 2." "The meditation was wonderful and the presentation was a great balance of learning and experiencing mandalas. The workshop was extremely therapeutic and relaxing. It opened my energy." "It was a relaxing way to spend the day and helped me remember how to use creativity to combat stress." "I learned that this workshop can be a very powerful tool... and it gave me a chance to know myself better." "The workshop was a wonderful, transformational experience for me. I had a clearer perception of what mattered to me. Even after the workshop, things continued to change." "I now have another tool to use in dealing with problems; a new way to access my subconscious mind."